Hungarian pianist; born at Budapest May 8, 1872. She received her first instruction in music from her cousin Albert Eibenschütz; Liszt is said to have played at a concert with her when she was only five years old. She later studied with Carl Marek, and from 1878 to 1885 at the Leipsic Conservatorium under Hans Schmitt. At her début in Vienna her remarkable playing created a sensation. After attaining her twelfth year she annually made a concert tour through Germany, Austria, France, Russia, Denmark, Norway, and Sweden; playing before the Queen of Denmark at Copenhagen, before the Czar and Czarina of Russia at the Gatschina Palace, and before the Emperor of Austria at Vienna, by whom she was granted an imperial stipend for five years. From 1885 till 1890 she was taught by Clara Schumann, and then resumed her concert tours, playing with great success in London. 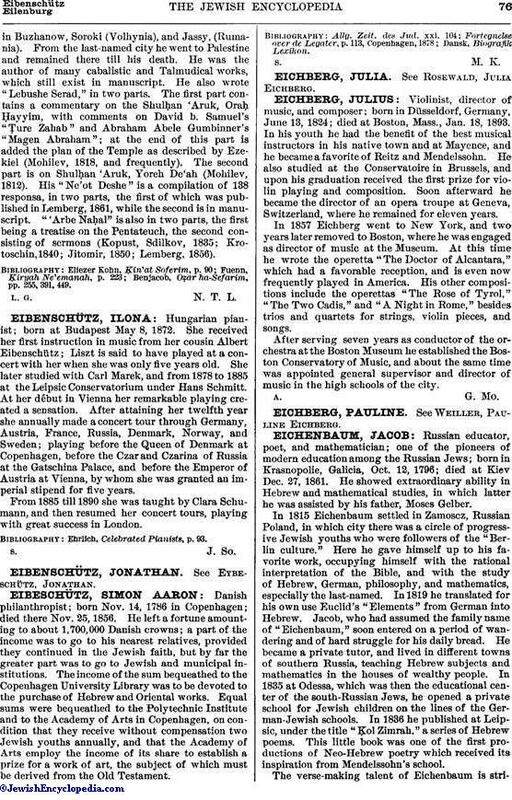 Ehrlich, Celebrated Pianists, p. 93.